CHARLOTTETOWN, PRINCE EDWARD ISLAND--(Marketwire - June 19, 2010) - The Government of Canada is investing in marketing focused on boosting international sales for Canadian seafood producers. Agriculture and Agri-Food Minister Gerry Ritz and Fisheries and Oceans Minister Gail Shea today announced an investment of over $1 million for the Canadian Aquaculture Industry Alliance (CAIA) to promote the high quality and diversity of their products globally. 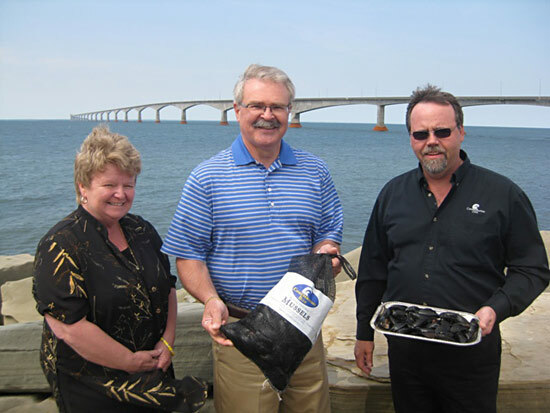 Minister Gail Shea (DFO), Minister Gerry Ritz (AAFC) and Stephen Stewart (Confederation Cove Mussels Inc.), who represented CAIA, celebrate the investment announcement in PEI. "We know we have the best seafood in the world," said Minister Ritz. "This investment will help drive that message in the global marketplace and put more of Canada's great seafood products on kitchen tables around the world." "Canada's seafood producers and processors depend on exports," said Minister Shea, Member of Parliament (Egmont). "International trade creates more than just revenues for the sector, it creates industry stability, jobs and prosperity for all Canadians." New promotional activities will feature the high quality and safety of Canadian salmon, mussels and sablefish to increase international sales. The marketing initiatives include a salmon public relations campaign, an in-store tasting program for farmed mussels, an industry-wide promotional tour for mussels and outgoing missions of industry representatives. "Today's announcement is great news for the growth of the Canadian aquaculture industry. With this funding, our industry members can continue to deliver the powerful message to international markets: that Canada is a world leader in the environmentally sustainable production of high quality farmed seafood products," said CAIA Executive Director Ruth Salmon. This $1.2 million investment is provided through the AgriMarketing program, which helps producers and processors to increase exports of Canada's safe, high-quality products around the world. The program provides funding to implement long-term international strategies which include activities such as international market development, consumer awareness and branding and industry-to-industry trade advocacy.